The Memorial Oval is a living memorial to the members of the armed services who paid the supreme sacrifice in World War II. On top of a hill within the oval, opposite the grandstand, is an obelisk built of Besser bricks. Steps lead up to it and within a fence surrounding it are field pieces on its north and south sides. The five trees at the rear of the monument are descendants of the lone pine at ANZAC cove and were planted around 1970. They represent all the major conflicts up until and including the Vietnam War. 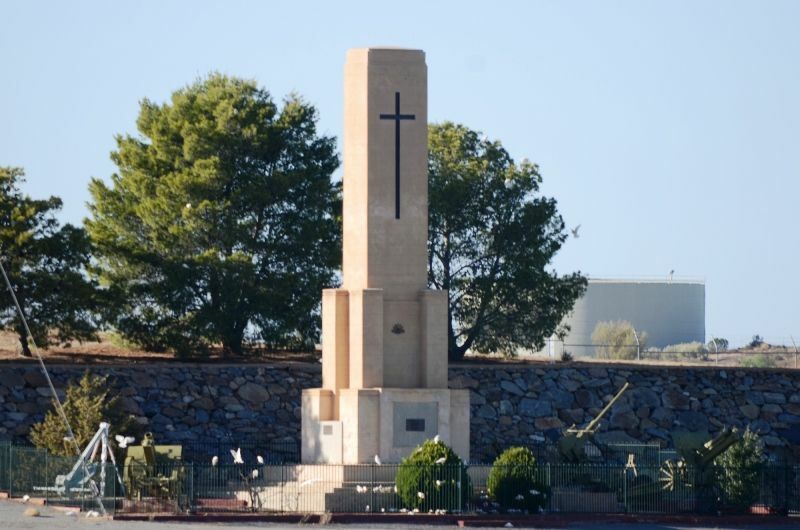 With the adoption by the W.I.U of A. yesterday of the proposal to contribute to the erection of a Memorial Oval for Broken Hill the project should be doubly assured. The B.I.C. has recommended a similar course to all affiliated unions. There seems to be little doubt that all the unions will adopt the recommendation and that the way will be cleared for the realisation of the objective. This is no waste of money. It is a case of contributing an amount of money too small to be noticed in return for which, plus what the workers' share of the cost will bring in, Broken Hill will have an oval that we will not only be proud of, but one that will be a real amenity in our midst. The value of such a sporting arena as that visualised by the Memorial Oval Committee cannot be estimated in terms of cash. It has a value to this community that quite outstrips the total cost, and the workers of Broken Hill will not have to foot anything like the full bill. In having such an oval, long since wanted in this city, a fitting memorial will be established to the memory of those who fell in the war; and one that all will appreciate especially the youth of this community. Barrier Daily Truth (Broken Hill, NSW), 16 September 1946.